This is a sight people who are not involved in animal rescue rarely get to see. These tiny kittens were born outside and today was the first time they ever saw a human and they were terrified. This is what happens to kittens who are born to unspayed, abandoned cats. This litter of kittens is fortunate to have been rescued in time to be tamed so they can one day be family pets. 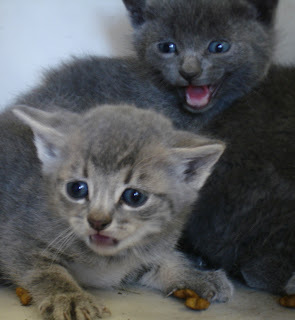 The window of opportunity for taming kittens born outside is very short and once they reach 12 weeks old, many will be too old to come around and will live their lives scared of people. These little ones will be fine because they are now in a nurturing foster home and they are getting plenty of tender loving care. It will be necessary for them to spend lots of quality time with their human foster family getting to learn what it means to be a cat and not a wild animal, which is the only life they would ever have known if they had not been rescued. We are lucky to have several wonderful and patient foster families willing to devote the time to help the kittens we rescue learn their human caretakers are not to be feared. Despite having spayed/neutered nearly 700 cats in 2008, the Medfield Animal Shelter is currently caring for 19 "unwanted" kittens. All of them are still young and fortunate enough to be in loving foster homes. We are hopeful that each and every one of these little ones will find a loving family wiling to make a lifetime commitment to them when they are ready to leave mom and start their own lives.